Based on the decidedly simple metrics of wins and losses, 2016 was not a success for the Eagles. In ten matches the Eagles went 3-6-1. This conceals as much as it reveals. Losing 20-24 to Italy is a sign of progress. A two try loss to Romania is not. But there were many positives for 2016 or the first year of the Eagles under John Mitchell. A wider, more skill-based playing style has been inoculated in players. Based on the Eagles performances in the final 20 minutes of matches, their fitness levels have improved as well. Looking forward to the 2017 campaign, it’s important that the Eagles outline specific, measureable performance goals. Anyone can say they want to go undefeated in the Americas Rugby Championship or beat a Tier 1 nation. How they get to that outcome requires an examination of weaknesses and a plan to improve them. Reflecting on 2016 once again, three areas need improvement if the Eagles are to be successful in the ARC and the broader international season: 1). exit strategies; 2). scrummaging; and 3). scoring tries. Number one focuses on the way teams play territorially. Playing offense or defense in the other team’s half reduces the likelihood of conceding line breaks or penalties that turn into points. Likewise it increases the likelihood that the other team will concede points. 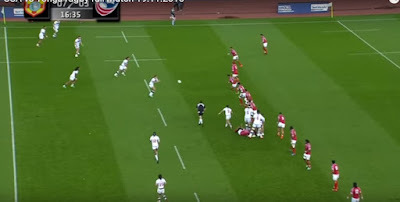 Number two, scrummaging, something I have covered at length, will continue to inhibit the Eagles and American rugby broadly until USA Rugby decides to make teaching the set-piece a priority. Rumor has it that Dan Cron, Hurricanes scrum coach, has been working with the Eagles forwards. This is a good first step. We’ll see the limits of its efficacy when Georgia plays the Eagles in June. In this post, I’d like to focus on the third goal: scoring tries. 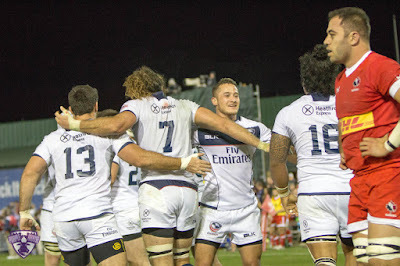 The Eagles scored four tries in three games during their fall campaign. During the 2016 ARC, the team did better against largely lower-ranked opposition. We know the Eagles can score four tries or more against Chile or Canada, but they struggle to replicate that against Italy and Tonga. Tries can be created from different avenues of attack. The maul or tight forwards ball has been a place the Eagles have scored tries in the past. Identifying and attacking overloads is an especially fruitful method for confident and skilled teams, think a 3v2 or 5v3. Given the Eagles increased preference for width and passing under John Mitchell, let’s examine those overload opportunities. Generally, overloads are created when a defense is disorganized. Perhaps the previous phase saw an attacker through a gap or break a tackle to get in behind the defense. The defense must retreat onsides and determine where to place their defensive resources. 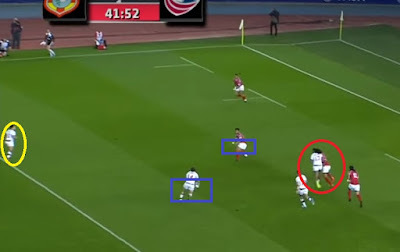 If attackers can recycle that ball while the defense is still retreating or on the wrong side of the ruck or not ready to launch, mismatches occur. Good groups of players identify these mismatches and correctly diagnose the best ways to exploit them. Above is a very good example of an overload in Tonga’s half. The Eagles have six attackers on the far side of the ruck. Tonga has six as well, but they aren’t spaced out well and the wing is playing soft to cover the kick. A long pass from the ruck to the first receiver effectively takes two of them out of the play. Given the situation, the Eagles should exploit this opportunity to create a line break or at the very least penetrate the gainline. As you can see, center Thretton Palamo receives a good pass from flyhalf Will Holder. Rather than attack the line, he turns his hips and launches a poorly executed cut-out pass. Even if the pass had gone to hand, the soft defensive line that Fetu’u Vainikolo starts from gives him a good angle to close down a long, wide pass. A better option would have been to run straight and draw the overloaded defenders or take contact. Unfortunately the Eagles have lost a good opportunity by not playing what the defense gave them. Here we see a very tenacious defensive play for Nate Augspurger. His strip turnover is made even better by Cameron Dolan’s link play, moving the ball quickly away to exploit a defense in transition. His Cardiff Blues teammate Blaine Scully does well to insert himself. But again, the long passes betrays the Eagles. In this case, the choice was well-thought out; there is a lot of attacking space to the left! But the pass goes to ground. If Scully can make the long pass or skirt around the forward in front of him to make it a shorter throw, this could have been a good opportunity for the Eagles. In the GIF above, the Eagles have an attacking scrum in a promising position of the field. The forwards win good ball for Will Holder and company. The dummy lines by Marcel Brache cause the Tongan midfield to tighten, creating space for Thretton Palamo. The center’s footwork puts his opposite off balance and a half gap appears, meaning the outside defender must turns inwards to cover. Now Palamo launches a poor pass to Madison Hughes in space who is a half-step too late. Again, the skill execution fails the Eagles. It’s encouraging that the players are confident enough to back themselves, but that connection isn’t happening. A more conservative play would have been for Palamo to take the half gap he created for himself and look for Hughes in support on the far side of the defensive line. We can see another example of this in the dying minutes of the first half. The Eagles have mauled well to put the attack on the front foot. 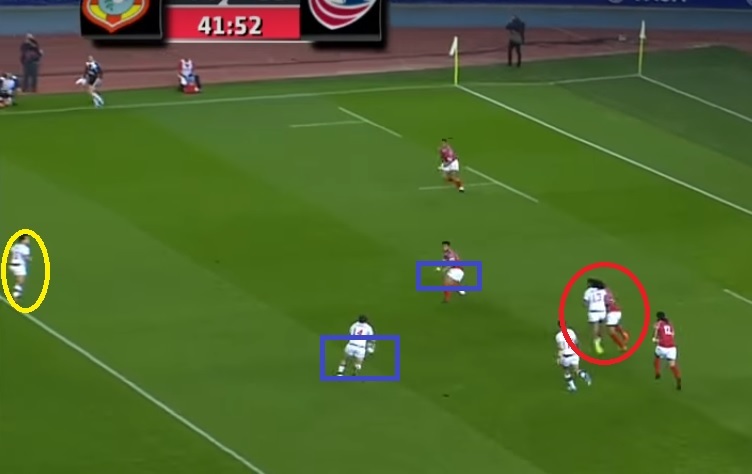 Below, we can see how a dummy run from Brache and long pass from Augspurger to Holder has taken several Tongans out of the defensive picture. Off-screen are two more Eagle attackers, Madison Hughes and Martin Iosefo. As Holder transfers the ball, we can see Palamo running an additional dummy line to freeze the defensive midfield. Behind him, Scully is looking for work from the blindside wing. Unfortunately, his line (in red) is too shallow. A better option would be the blue line, which hews tighter to the space Palamo has vacated. A more direct line would cause the defense to slow their drift. There is still chance, however, if Scully can re-orient his hips towards the defense as he receives the ball. We can see the good job Palamo does on his dummy line too slow the defense. He even throws a bit of a block for good measure. Notice, however, the hips of Scully with ball in hands and the defender in space. The Blues wing is turned fully outside to make a long pass to Hughes. The Tongan defender has mirrored this and opened his hips out to go into a drift defense. If Scully can turn his hips and present himself as a running threat, he will have created a 3v2 and put the defender into no man’s land. Instead we see a promising attack movement bundled up. Fortunately, Nate Augspurger makes a heads-up play in the very next phase to put Martin Iosefo in the corner to score the Eagles only try of the half. But the Eagles cannot rely on those moments of individual brilliance to produce enough points. Given four good attacking opportunities in a half the Eagles failed to capitalize; either due to a skill breakdown or poor decision-making. Against Tier 1 teams, only a handful of these mismatches will be created. 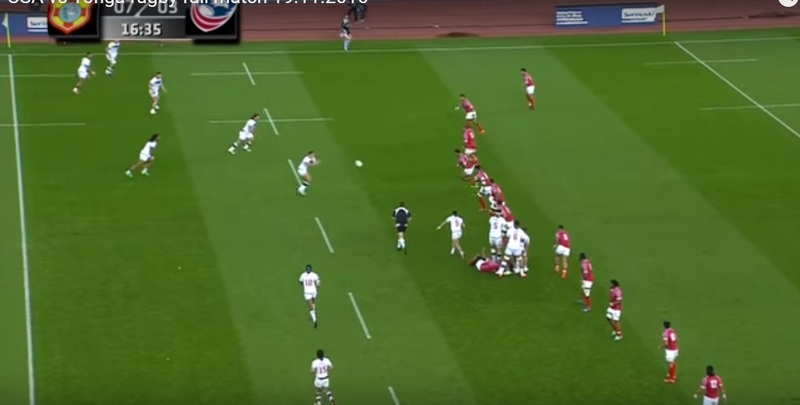 Even a successfully executed movement is not guaranteed to turn into a try or a large gain. But the first step to increasing the number of tries scored will be identification and execution of these moments. Keep up the good work Derek. Great points and examples. It illustrates the glaring weakness.......not enough Americans playing professionally. That is the only way to raise the level of play. PRO Rugby is probable defunct. How can we get the Americans that want to commit to a career as a professional rugby player some contracts? What about an American side based in the UK? Either the Guiness Pro 12 or a team that can start in the Championship division in England. There have got to be investors and sponsors that see a lucrative end game. If it happens then by RWC 2023 the US could be a Tier 1 nation, meaning more tv exposure and more money.